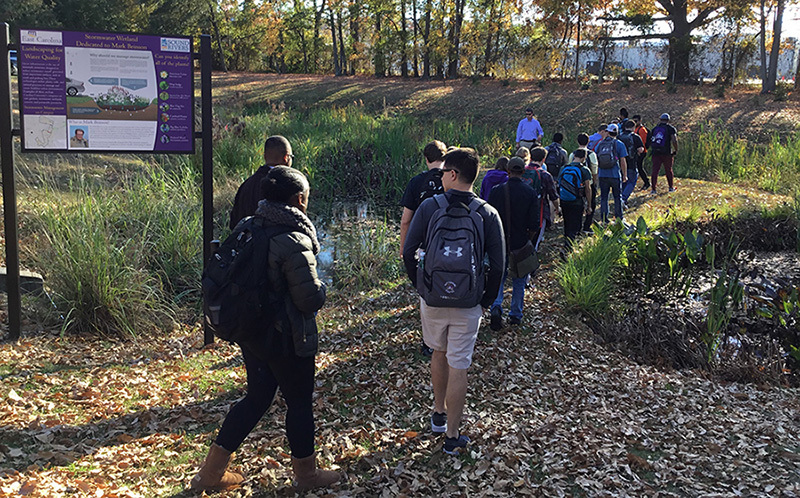 Geography and Planning students in Urban Design class (Fall 2017) on a field tour to learn about exciting stormwater management initiatives and design on East Carolina Campus. Looking at a constructed wetland with John Gill (Assistant Director, Facilities Services and Landscape Architect) and Chad Carwein (Sustainability Manager at ECU). Posted December 15th, 2017 in Research. Posted April 28th, 2017 in Research. Hurricane Matthew has cut a wide swath of damage and flooding in the state of North Carolina. As the City of Greenville, located in the Tar-Pamlico River Basin in Eastern North Carolina, deals with rising water in the Tar River, below are images that document the impact of the flooding in the city. The Tar River is located to the north of Greenville flowing west to east, dividing the city into a lower elevation north side and higher elevation south side. Most of the flooding impacts are in the floodplain areas immediately south of the Tar River and to the floodplain areas in the north. The second set of images below were taken on Friday, October 14, 2016 between 10:00am-11:30am, AS the water in the Tar River crested. According to NOAA, the Tar River was initially projected to crest at 26.1 feet, which was later revised to 24.5 feet. October 14, 2016: Flooding at the Pitt-Greenville airport. Critical infrastructure in the floodplain. October 14, 2016: Flooding on Airport Road. October 14, 2016: National Guard truck on Airport Road. October 14, 2016: Flooding on Memorial Drive north of Tar River. October 14, 2016: Flooding at gas station on Memorial Drive north of Tar River. October 14, 2016: Water under the Pitt Street bridge. October 14, 2016: Flooding at Town Commons. October 14, 2016: Greene Street bridge closure. 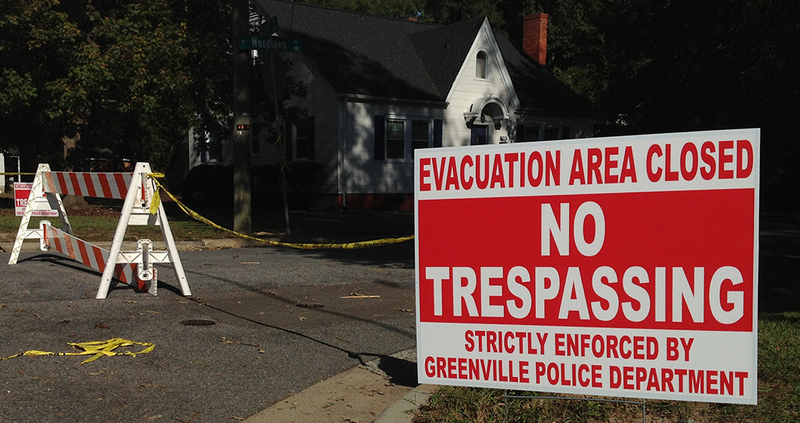 October 14, 2016: First street neighborhoods under mandatory evacuation. October 14, 2016: Evacuation areas closed off. Posted October 14th, 2016 in Research. Hurricane Matthew has cut a wide swath of damage and flooding in the state of North Carolina. 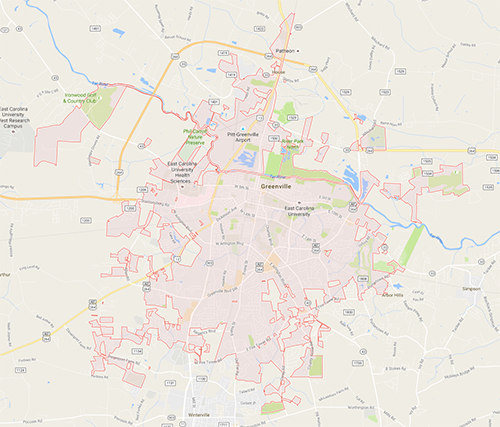 As the City of Greenville, located in the Tar-Pamlico River Basin in Eastern North Carolina, deals with rising water in the Tar River, below are images that document the impact of the flooding in the city. The Tar River is located to the north of Greenville flowing west to east, dividing the city into a lower elevation north side and higher elevation south side. Most of the flooding impacts are in the floodplain areas immediately south of the Tar River and to the floodplain areas in the north. The first set of images below were taken on Monday, October 10, 2016 between 10:00am-11:30am, BEFORE the water in the Tar River had crested. 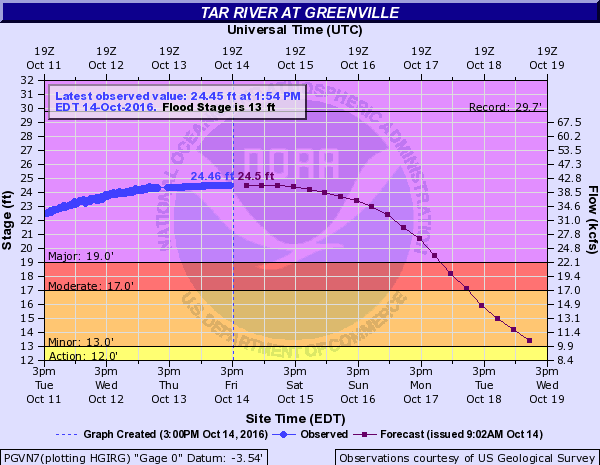 According to NOAA, the Tar River was initially projected to crest at 26.1 feet, which was later revised to 24.5 feet. October 10, 2016: Dog park at Greenville greenway. 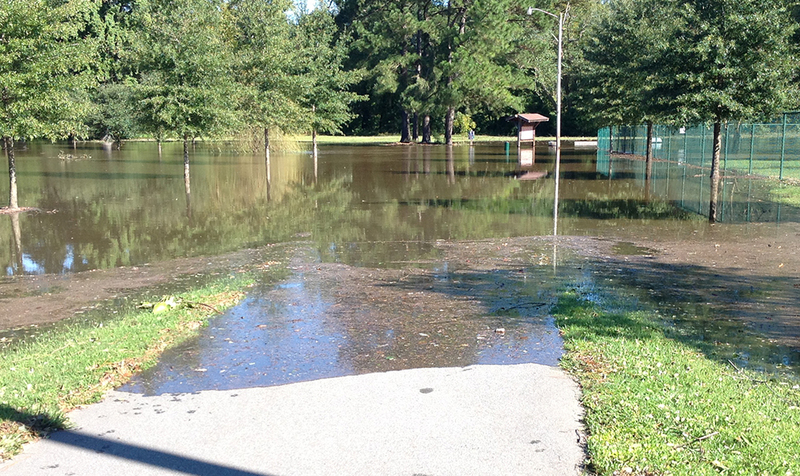 October 10, 2016: Greenville greenway trail underwater, only the information boards are visible. October 10, 2016: Greenville Town Commons from the Greene street bridge. October 10, 2016: Tar River flooding at the Town Commons. Posted August 14th, 2016 in Research.